Habitat: Upland. 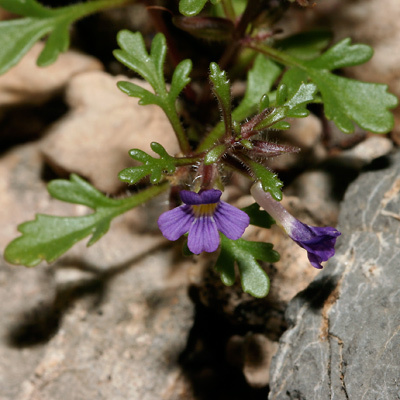 This plant grows in gravelly soil on sunny slopes and flats and in dry washes in upper elevation desert transition areas, grasslands, and oak-juniper woodlands. Flowering Season: Summer, Early fall. 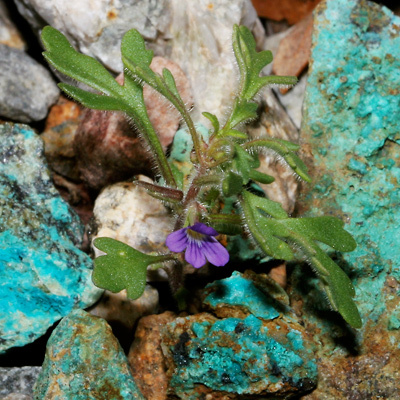 These small, easily overlooked wildflowers bloom after the summer monsoon rains have begun. 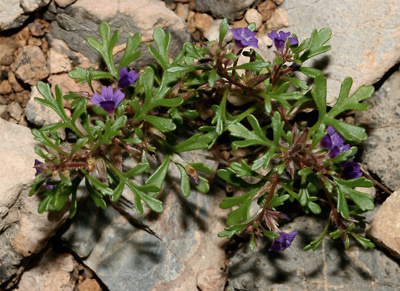 Description: The small flowers emerge from the leaf axils on very short stalks and are tubular with a yellow throat and 2-lipped with a 2-lobed upper lip and a larger, 3-lobed lower lip lined with dark purple. The flowers are followed by short, plump, bean pod-like, point-tipped, longitudinally opening seed capsules containing numerous spirally-ribbed seeds. The leaves are plump, green, glandular hairy, opposite, and deeply pinnately lobed with 3 or 5 round-tipped main lobes. The stems are reddish, glandular-hairy, branching, and erect to spreading.